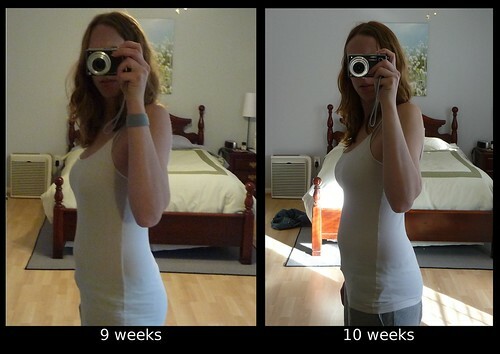 Now over 10 weeks along, and as far as I know, I'm still pregnant. Into the double digits! Symptoms are much the same as last week. I've been wearing my Sea-bands nearly non-stop, although I do seem to be less nauseated on the weekends (maybe because I'm more active and easily distracted than I am at work?) so I didn't wear my bands at all today and only had a couple minor waves of nausea. I of course would love for my nausea to stick around indefinitely if it would mean a healthy pregnancy, but from what the internets tell me, it usually seems to last only a few weeks before it dissipates, and I've had it for over four weeks now, so I guess I shouldn't be too surprised if it starts going away soon. In the meantime, pretzel rods are my best friend, since I'm not a fan of saltines or other crackers, and since I usually like pretzel rods anyway, it's been convenient and welcome that I haven't developed some aversion to them since they seem to help with the nausea. I've also been more thirsty lately, and have been craving fruit juices... but since I still have a bottle of blueberry/pomegranate juice in my fridge at work from the first pregnancy (two years ago...) that I still hardly ever touch (although when I do it still tastes fine! ), I can't justify buying more juice if it's just going to sit for years. So instead I've been gravitating towards the fruits where the juices I'm craving originate from (grapes, apples), and that seems to be working fine. My weight seems to have stabilized, which I think is a good thing. I thought I was going to get a lecture from the doctor last week when she asked what my pre-pregnancy weight was and I actually told her the truth. I'm already not telling the truth about the date of my "last menstrual period" since it's two days off from my adjusted LMP based on the transfer date, and who knows if that will make a difference further down the road with being induced if I end up going over my due date. Anyway, so my weight the last few weeks has been about 5 pounds up from my pre-pregnancy weight. While I'm not sure what my weight gain is supposed to be at this point, I kind of doubt it's supposed to be 5 pounds if I'm only supposed to gain about 35 pounds over the course of the pregnancy and the baby is only weighing a matter of ounces right now. I also attempted to go out riding this morning. It's just sad to know that my riding days are numbered, and although I had tried to give up horses before and survived it (but barely), I'm definitely not looking forward to having an open-ended hiatus from riding again. I've built up some good relationships at the barn where I've been riding the last few years, so I'm also worried about having to start over at a new barn if/when I start riding again after next summer if the same horses aren't still available for me to ride. So although my doctors weren't thrilled with me continuing to ride, I had come up with a few rules for myself as an attempt at a compromise: 1) don't do anything stupid, 2) don't ride for as long as I used to, and 3) stay in two-point as much as possible. I've pretty much failed at #3 (my legs are pretty pathetic so I can't stay up in two-point as I'd like), but I've been doing all right with numbers 1 and 2. Today I had to invoke rule #1, though, since I went out for the first time in a couple of weeks and it was freezing cold out and really windy. Rudy tends to get a bit spooky when it's windy, so given that he was probably going to be pretty fresh anyway, I ended up just brushing him and giving him his apple. I really only have maybe 2-3 more possible times that I may try to ride again before I tell Rudy's owner that I'm going on a indefinite riding break, and I'm not even sure how that will go since the cold is definitely making it more tempting to just stop riding now. I guess it's good that it's not warm out, since I really live for riding in the summers, and I have a feeling I would try harder to keep riding then... which may go against #1.